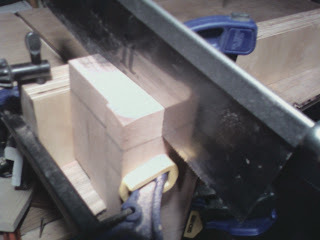 After careful measuring I took my dovetail saw and cut the tenon. This is the part that will slide into the body of the guitar attaching the neck. This second cut is a little more difficult because it s not at 90° of the other cut. This cut has a few degree inward slant – this is to allow for the curved body of the guitar to fit snug. 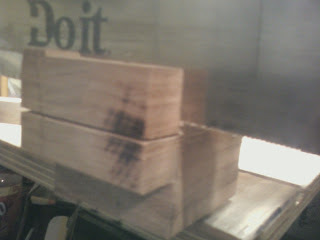 Below is the completed tenon. After finished cutting this tenon I regret not waiting 'til I had the truss bar channel routed before completing this task. 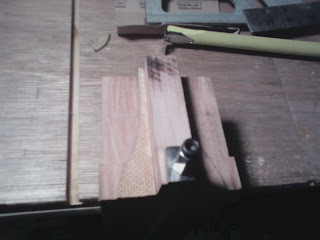 This photo will be used again to show marking out the heel block carving. Building - Women Now you like each other, the excitement has begun.